It all started with having an amazing Mother who would open up her jewellery box for me and tell me the stories of the beautiful pieces inside…..
My Mom is from Australia. So her whole side of the family lived there and we lived in Canada. My Nana and my Auntie Kay would send my sister and I gifts of jewellery when we were little. These gifts were wrapped up in little satin pouches and kept safely in one of my Mom’s drawers. We were rarely allowed to wear them (thank-you Mom, since I’m sure they would be lost by now if we could) but we were often allowed to take them out of the drawer, unwrap them, and admire them. I would make up a million little stories in my head about why I had to keep them so preciously hidden….think The Little Princess and Little Orphan Annie themes…. That’s a nice little story and what a beautiful jewelry box! This is such a great blog idea! Thanks so much Laura! 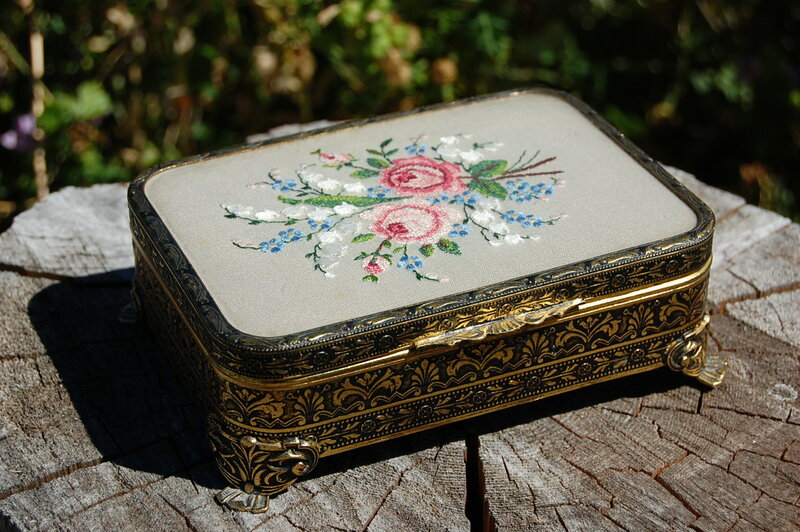 I think the top of the jewellery box was actually hand embroidered by my Nana….I will have to double check with my Mom and share that story too.